Check out the adorable hat ornaments that we made! This project idea came from Yarn Whimsies for the Holidays, which was provided to me by Leisure Arts for review. I received the red, white and green yarn from Premier. This post contains affiliate links. First, a few words about this idea book. 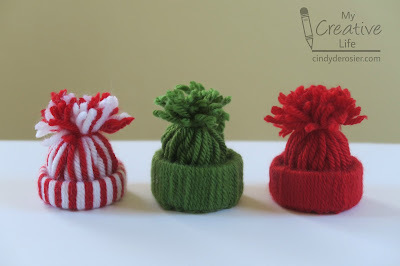 Yarn Whimsies for the Holidays includes instructions to make 13 simple holiday projects using yarn. Each of the projects is child-friendly and really cute. The directions are clear and each craft has a bulleted supply list. The large photographs throughout the book show off the finished projects beautifully. At the back of the book, along with stitch diagrams and patterns, are instructions to do finger crochet. I've never done any crochet, so I gave it a try. It was so quick and easy! We chose to make the hat ornaments as our first project. The supply list is really short - just a cardboard tube, yarn and scissors, plus filament or cord to hang the ornaments. 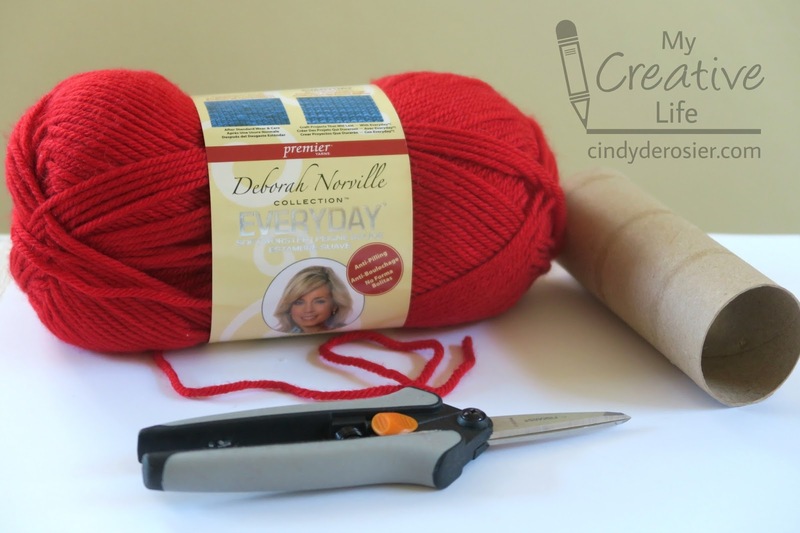 Begin by cutting a narrow ring (approximately 3/4") from the tube. Cut 8" lengths of yarn. The number you need depends on the diameter of the cardboard tube. We needed approximately 35 strands for each hat. Attach each piece of yarn to the cardboard ring using a lark's head knot. (To make the striped hat like our example at the top, simply alternate between two colors.) Continue until the ring is completely covered and no cardboard shows. Pull all the yarn ends up through the center of the ring. Use an extra piece of yarn to tie the ends together approximately 1" above the ring. Then trim the yarn so that it is even and resembles a pom pom. Finally, tie a fine cord or filament to the top to hang it. Here is the photograph from Yarn Whimsies for the Holidays. Aren't these ornaments so colorful and cute?! 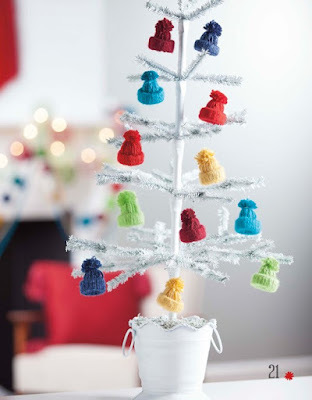 We made a few other hat ornaments besides the ones at the top of this post. Tomorrow I'll show you how I combined two of them into something completely different! OMYGOSH!!! These are JUST ADORABLE! I loveeeeee them!!!!!!!!!!!!!!!! Cindy, these are crazy cute. May we do a video of this project and give you credit? We'll link right back to your site.